ï¿½Thoroughly Viennese, bass-baritone Erich Kunz excelled in serious roles (although he sang rather few), comic parts and in operetta characterizations. An indispensable participant in recording producer Walter Legge's Champagne Operetta series in the early 1950s, Kunz, together with Elisabeth Schwarzkopf, defined Viennese operetta style - its lightness, grace, and charm. With a rich, masculine voice, he was a definitive Figaro, Leporello, and Papageno in the tradition of Mozart performance that sprang from the Vienna Opera immediately after WWII. An incomparable Beckmesser, his interpretation was preserved on two live recordings, and he left a number of delightful recordings of Viennese cafï¿½ and university songs. Kunz studied in his native Vienna, primarily with Theodore Lierhammer at the Vienna Academy. His dï¿½but took place at Tropau in 1933 as Osmin (a part for deep bass) in Mozart's DIE ENTFï¿½HRUNG AUS DEM SERAIL. Following that, he sang with a number of smaller German theaters before being engaged by the Breslau Opera for three years. Kunz made his first acquaintance with England when he was offered an opportunity to understudy at the Glyndebourne Festival in 1936. He was soon thereafter assigned several smaller roles. 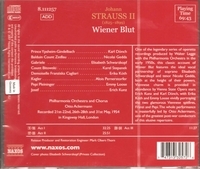 In 1941, Kunz became a part of the company at the Vienna Staatsoper where he remained throughout his career; he was given the title of Kammersï¿½nger in 1948. During the war years, he sang throughout Austria and Germany, primarily in Mozart and Wagner . He made his dï¿½but at the Salzburg Festival in 1942 as Guglielmo in COSï¿½ FAN TUTTE and in 1943 became the youngest artist ever to have appeared in a major role at the Bayreuth Festival when he sang Beckmesser in DIE MEISTERSINGER. A Metropolitan Opera dï¿½but waited until 1952, but Kunz's appearance as Leporello on 26 November brought a warm response from the audience and positive reviews from the critics. Both local and national writers commented upon his handsome voice and subtle comic skills. Many could recall only a few comparable artists in a role frequently immersed in slapstick routine. The Metropolitan Opera enjoyed his presence for just two years. In addition to Leporello, Kunz appeared as Mozart's Figaro, Beckmesser, and Faninal in ROSENKAVALIER. Chicago heard his treasurable Harlequin in ARIADNE AUF NAXOS and Leporello, both in 1964 and, two seasons later, his wily, yet innocent Papageno in DIE ZAUBERFLï¿½TE.